For Community Quilt #148, I decided to use white Magna Glide pre-wound bobbin thread for the top AND the bottom thread. Why? because the colour match was perfect. So I slipped the bobbin onto a hacked thread holder and started. 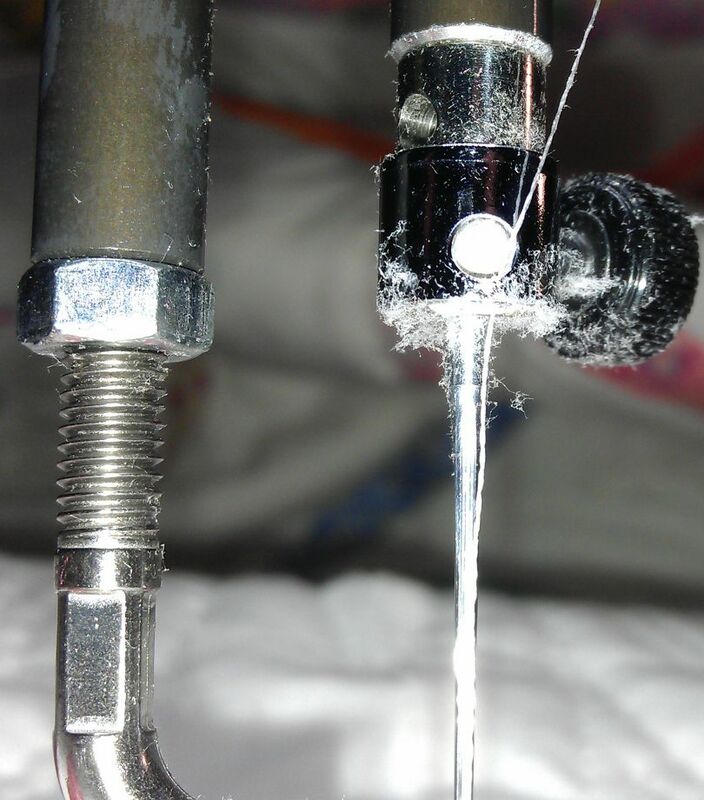 What I didn’t realise was how much static there was on the machine, which picked up the tiniest bits of polyester ‘lint’ from this thread and deposited it on the metal bits of my Handi Quilter Sweet Sixteen! I’ve never noticed any issue with this sort of static buildup in the bobbin housing, but it was very prevalent in the top thread path. I wonder if it’s due to the continual up and down motion of the thread before it finally gets to the eye of the needle and into the quilt? The bobbin thread, on the other hand, just loops off the bobbin in one continuous motion, as far as I’m aware. Whatever the reason, I had to clean the tension disks and other parts of the upper thread path several times while quilting this quilt. 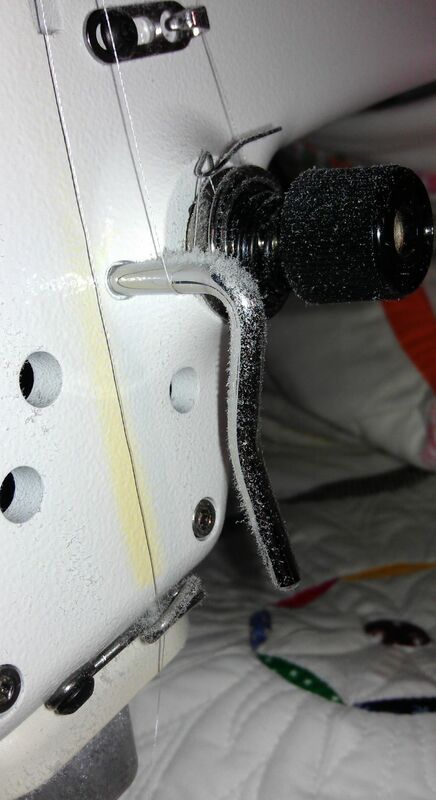 Here are some pictures to show that static build up at the tension disk area and near the needle. I have never seen, nor experienced, such a situation and would be a little concerned as to the cause and possible consequences of the static build-up. I know that a sudden discharge can produce unwanted results with computers, etc, so I would imagine that the SS ‘workings’ could suffer, also. Even with the low humidities of last winter’s heating season and my use of poly threads, I have not encountered such static!!! Wow…I haven’t seen anything like what your photos show, Rhonda. Treadlemusic has a point, I think, about the static and its potential for trouble in regards to the machine/computer. I’d be curious to see what response you would get from HQ’s customer service dept. if you sent them those photos.